*"This is a hybrid. This is a cross, ah, of bluegrass, Kentucky bluegrass, featherbed bent, and Northern California sensimilla. The amazing stuff about this is that you can play 36 holes on it in the afternoon, take it home and just get stoned to the bejeezus-belt that night on this stuff." sits at an elevation of 5,250 feet, just short of a mile high. If a player has ingested two cannabis-infused lemon drops and part of a gingerbread cookie laced with 100 milligrams of THC, as I recently did, it will feel a little higher. It would have been far more typical for me to have a Bloody Mary, an Irish coffee or a beer before stepping to the tee, for golf and alcohol have enjoyed a long and happy relationship. In fact, the earliest known references to golf and Scotch whisky date to within a mere 40 years of each other, in 15th-century Scotland. These days, it's the rare course that doesn't have a bar attached: the 19th hole. Golf and marijuana do not share such a bond. Yet opinions about weed are changing fast. A Gallup survey in October 2013 showed 58 percent of Americans supported legalizing marijuana. In more than four decades of polling, it was the first time more than half the respondents backed legalization. Golf Digest surveyed its readers and social-media followers and found that although only 3 percent said they smoke pot playing golf, 11 percent of those in the 18-34 age group admitted to partaking some or all of the time (see page 151). Which is why I find myself standing here—already a little lightheaded—on the first tee at City Park with Ryan Cook, Josh Malman and Mark Scruggs. As of Jan. 1, it has been legal to buy and consume marijuana for non-medical purposes in Colorado—and these three are among the many enjoying the privilege. No one would confuse my playing partners with Carl Spackler, the stoner groundskeeper in "Caddyshack." Cook, a clean-cut 34-year-old, is general manager of The Clinic, a marijuana dispensary with six Denver-area locations. Malman, 34, is head of The Clinic's growing operations. Scruggs, 45, is the general manager of Weedmaps, a sort of Yelp for legal marijuana. Scruggs got into golf in his late 20s and plays two or three times a week. He enjoys an occasional beer but prefers weed. He finds it helps him "relax and focus without becoming upset or frustrated." Unlike booze, pot doesn't "impair my dexterity or motor skills," Scruggs says. Cook, who took golf lessons as a kid and started playing again in his early 20s, praises weed's capacity for taking the edge off a frustrating game. "It can really help to provide a calming demeanor," he says. The guys do their best to make sure I keep calm throughout our round, offering me hits from a little glass pipe packed with different strains of cannabis. The weed has its strongest effect on me during the back nine. I'm definitely...loose. My mouth has gone pretty dry, and I notice that I keep absent-mindedly putting my glove on to putt when I've just taken it off to putt. But otherwise I'm in control and able to swing my clubs without any major complications. Though Malman is driving the cart, on this wide-open course I'd be perfectly comfortable doing so if needed. We finish our round in a little over four hours. My score: 99. That's 10 to 15 strokes worse than usual for me, but not way outside my realm of possible outcomes. Only once do we seem conspicuously "high." On 18, we wait about 30 seconds too long to decide who is away—before realizing, with a telltale laugh, that we're behaving like stoners, and somebody needs to putt. Technically, what we've been doing is against the law. In Colorado, even though it's legal for adults to buy recreational marijuana, public use is still prohibited. Cook, Malman and Scruggs say they never get hassled on the course because they are respectfully discreet. Denver's Parks and Recreation Department is aware pot-smoking goes on at its golf courses and other public venues, says Jeff Green, director of communications and marketing, but it's not really an issue. "It does not ever rise to the top of the list of things people complain about," he says. "In fact, marijuana does not generally make it onto the list at all." For the past four years, City Park has hosted The Clinic Charity Classic, a tournament put on by Cook's dispensary. Last year the event raised more than $30,000 for the Colorado-Wyoming Chapter of the National Multiple Sclerosis Society. The attendees constitute a Who's Who of cannabis-industry folk, and as such the air is smokier than usual—some of it compliments of the tournament's "joint cart ladies." "I play in a lot of golf tournaments, and there is nothing like this one," says Allen St. Pierre, executive director of the National Organization for the Reform of Marijuana Laws (NORML). "You start with these kegs of beer, because Denver has this vibrant microbrew scene, and then on top of that you have all this really, really potent cannabis. I don't think anyone was able to finish." St. Pierre, a golf nut for most of his 48 years, views the game as two separate pastimes: There's "regular golf" and there's "jah-golf," which is exactly what you think it is. St. Pierre plays much of his jah-golf at public courses, though he has also gotten high at many of Washington, D.C.'s tonier private clubs. "I still feel like a teenager" at these clubs, he says. "Oh, look! I've hit my ball into the woods! Everybody disappears to 'look for it' and comes back a few minutes later in their right mind."
. (General manager Glenn Smickley says, "I've been here two years and never smelled it or seen it being consumed, but I'm not so naïve as to think it doesn't happen.") It's legal with a California medical-marijuana card. Says a Bay Area tech executive, speaking of another club: "As opposed to guys who walk up to the tee with a Bloody Mary, we'll walk up with a nice flowered bud, and you say, 'Look what I have for us,' and we say, 'Let's crack that open in a few holes.' "
, among others. For the most part he fits right in, though he has a buddy who leaves Hartfield out of his group when playing with a certain conservative friend. "It's funny because this guy will have a double [cocktail] at 9:30 a.m. and another double at the turn, but if I brought my torch out, he'd be like, 'What the f--- is this?!' "
Some golfers believe weed gives them a competitive edge. One California financial executive recalls trying to qualify for the U.S. Amateur in the late '90s and struggling through the first of two 18s. "My brother was on the bag and he said, 'Why don't you go into the woods and smoke up?' So I did. And it calmed my nerves. I ended up shooting a couple under, and my name was on the leader board. I ended up missing by a shot." Others like the way it helps them tune out distractions. 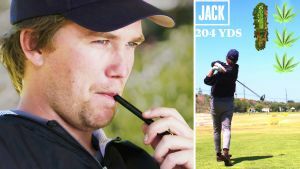 "When I was stoned and playing golf, nothing else mattered," says a former college golfer, now a 32-year-old Connecticut paralegal. "My station in life, how much money I had, the fact that I was single, etc.—all of these things were inconsequential." Wholly focused on each shot, "I played my nastiest golf," he says. This included the day he took his 36-hole Playing Ability Test, required to become a PGA member. He passed. "I used to say, 'My handicap is 4, but when stoned, I'm scratch.' "
One important thing to keep in mind: Whatever weed might do to your game, it has also been shown to affect short-term memory. A couple of New York City-area golfers learned this lesson a couple of years ago. They'd shot the low score at a member-guest tournament and decided to take a little "drive" to celebrate before claiming their prizes. "We got back, showered and went to the dinner," one of them recalls. "We looked at the leader board, and we weren't on it." What had happened? "We forgot to hand in our scorecard." I bought my supplies at one of The Clinic's clean, brightly lit locations. Elle Shobe, a cheerful and knowledgeable young "budtender" and a former Miss High Times, walked me through my purchases. For about $100—expensed to Golf Digest—I walked out with an eighth-ounce of Sour Relief bud, one of the center's in-house strains, 10 marijuana-infused lemon drops, a THC gingerbread cookie, glass pipe and lighter. It was my first purchase, legal or otherwise. Yes, as a younger man, I might have taken hits from passing joints at concerts or backyard parties, but I had never felt the need to buy any. This meant I had a few things to consider before traipsing down to the intersection of marijuana and golf for this assignment. My boss at Texas Monthly, where I'm an associate editor, would have to approve. I needed to ask my wife. Would we say anything to our 11-year-old daughter? What would her teachers and school administrators think? And what about her classmates' parents? In the end, it was my wife's mother who expressed the most concern. "What if you get addicted?" she worried. She meant the pot, not the Golf Digest assignment. Weed and the PGA Tour have an unfriendly relationship, at least officially. "Marijuana is illegal in the U.S. and most other countries," reads the tour's anti-doping-program manual. "Involvement with illegal substances goes against the spirit of our sport." No doubt there are some players who light up, though. In 2010, Matt Every served a three-month suspension from the tour after he was arrested on a misdemeanor possession charge—a charge that was later dropped. "Honestly, man, I know more people who smoke marijuana than who don't smoke marijuana," Every told reporters. "I know that's probably not the politically correct thing to say, but it's the truth. It's not a big deal to me." Robert Garrigus told Golf World he'd smoked pot while competing on the Nationwide (now Web.com) Tour. "There were plenty of guys" who did, he said in a 2011 interview. Former tour caddie Michael Collins suggested in a Golf Channel interview that it's happened on the PGA Tour as well. Last year the World Anti-Doping Agency made it easier for marijuana users to avoid detection. Now, an athlete's urine needs to show 150 nanograms of THC per milliliter to get a "positive" test result. That's 10 times the old threshold. But the PGA Tour isn't budging. Its random drug tests, which it began administering in 2008, continue to use the much lower 15 nanograms of THC per milliliter, says the head of the tour's anti-doping program.